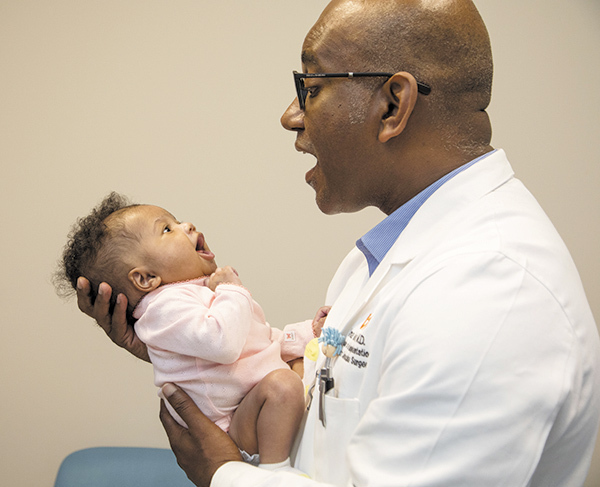 Umar Boston, MD, a pediatric cardiovascular surgeon at Le Bonheur Children's Hospital, has done approximately 100 heart transplants on children. None of them was any more challenging than one he did almost a year ago. A baby was born with dextrocardia-heterotaxy syndrome with congenital heart block. In short, electrical activity was blocked between the upper and lower chambers of the heart. Also, the baby's heart was malformed. In a normal heart, the apex of the heart points to the left and the major veins that go into it come from the right. In this baby, it was the opposite - the heart pointed to the right and the veins came in from the left. In addition, the function of the heart was extremely poor. This combination, Dr. Boston said, is uniformly fatal. "So we offered the mother two things," the doctor said. "You can take your baby home and do nothing. Or we will go out on a limb and see if we can get the child to transplantation, knowing this is a very rare type of transplant that the baby would have to undergo." The mother opted for a transplant. In surgery, the surgical team had to take a donor heart and place it in the opposite configuration than the baby's previous heart had been in. "It's one of the more complicated operations one can imagine or perform," Dr. Boston said. "The child is now 10 months out from transplantation, and she's probably done the best of any transplant that I've ever taken care of." Dr. Boston is surgical director of the Heart Transplant and Mechanical Circulatory Program and surgical director of the Adult Congenital Heart Disease Program at Le Bonheur. Two unfortunate events - a death and a hurricane -- played a big role in getting him to where he is today. Dr. Boston was born in the South American country of Guyana, and his family moved to Papua, New Guinea, when he was 5. The father, Derrick Boston, was a barrister in criminal law but was plagued by heart disease. He had his first heart attack at age 35 and died of another at age 42. What he needed was a bypass operation, but Dr. Boston said his father was reluctant to go to a doctor and believed he could rely on medication. "When you're 11 and you see your father die of a heart attack, you question whether anything else could have been done," Dr. Boston said. "My initial ambition to pursue medicine was certainly born out of the experience of having my father die at a very young age from cardiac disease." Years later, after completing his cardiothoracic training at the Mayo Clinic, Dr. Boston was doing a fellowship at the University of Alberta in Edmonton when one of his mentors suggested he apply for a job at Tulane University. Dr. Boston was about to go to New Orleans for an interview when Hurricane Katrina hit. One of the surgeons at Tulane suggested he try Le Bonheur instead. He got the job, and felt fortunate about it. "People who are 'crazy' enough, or diligent or ambitious enough to pursue pediatric cardiac surgery - you study for 19 years after high school, and the surgical training is 12 years," he said. "At the end of that there is no guarantee of a job. "The number of pediatric cardiac surgeons in the United States is roughly about 150. It's a very, very highly specialized and highly competitive field. The year I was training there were about 30 of us who were doing some form of pediatric cardiac fellowship, and there were only three of us who got jobs." He started at Le Bonheur as the junior surgeon along with two other surgeons, Dr. Chris Gilbert and Dr. Jeff Meyers. Within a year, Dr. Gilbert left for another job, and not long after that Dr. Meyers took a job in Boston. "This is a specialty where you need good mentorship during training and, even more important, after your training. So I was by myself and had to carry the cardiac program here at Le Bonheur for two or three years before I got some help. "It was trying times, I would say." In 2012, Dr. Boston left Le Bonheur to go to Washington University in St. Louis. A big reason was that Le Bonheur's heart program, in his mind, wasn't at the level where it needed to be. "We did not have a heart transplant program," he said, "and one of my big interests is in transplantation of children with congenital heart disease. Washington U. and St. Louis Children's Hospital provided that opportunity. I didn't leave Le Bonheur with any ill feelings. I really wanted to build a transplant program." In 2015, he got that chance. Le Bonheur upgraded its commitment and brought Dr. Boston back. "During the time I was gone, there was a change in plan," he said, "and the direction was 'OK, if we're going to be a top-notch program, we need to provide all these services.' They saw what the future of cardiac surgery was looking like." While he was in St. Louis, Dr. Boston said, Le Bonheur sent him four to six transplant patients each year. But then the hospital demonstrated its commitment by hiring Dr. Jeffrey A. Towbin, who, Dr. Boston said, "is one of the big names in cardiomyopathy and transplantation in the country." Dr. Towbin is now co-director of the Heart Institute at Le Bonheur. Upon Dr. Boston's return, he said, "we knuckled down, built the infrastructure and obtained the resources that are required to start a heart transplant program." "By October 2016 we did our first heart transplant," Dr. Boston said. "By December 2016 we had performed two heart transplants and had put in two mechanical devices. And in 2017 we really exploded and did 12 transplants, probably some of the more complex heart transplants that we can do." Donor hearts come primarily from remote sites within a 500-mile radius of Memphis, which encompasses a population of 92 million people. "The donor heart doesn't last forever," Dr. Boston said. "So within 20 years a baby will require another heart. I wouldn't say transplantation is a cure. It provides a better quality of life for the child. Hopefully, with the development of advanced therapies, the donor heart may last longer."